This is an automatic code generation utility. It produces various code, ascii text, source, binary etc. from a user entered graphic. 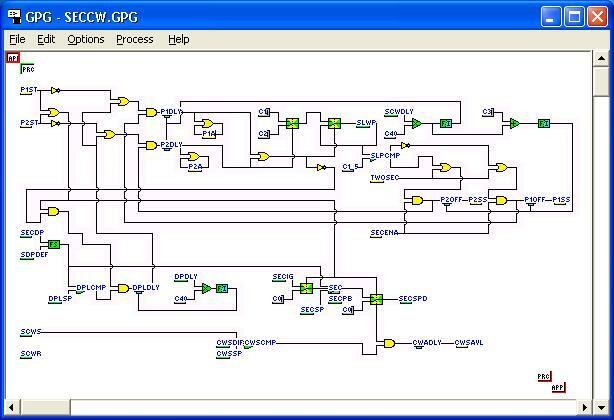 A typical use is to produce control programs from control diagrams. What is now called Function Block programming. It has also been used to produce control programs from plant-equipment diagrams and model based control systems and diagnostics from plant-equipment graphics. GPG also has the ability to modify the graphic based on answers to questions and processing results. The system is very flexible. The user can produce symbols to be used in the graphics and produce attribute files which determine what GPG does when it processes the particular symbol. The attribute programming language is interpreted by GPG. The type of file(s) produced from the graphic is totally controlled by the attribute file. It could be HTML, Python, C source, BASIC source, Spin Language, Visual Basic source and form data, Assembler, even machine language. It might also be models and simulations, fuzzy rule sets, expert system rules and parts lists. Just about anything. One drawing can be processed into multiple files at one time. The SWFTEC Graphic Program Generator works with Microsoft Windows 95, 98, Me, NT, 2000, XP, Vista , Windows 7, (Win 8 and 8.1 need to be tested) and Windows 10 Operating Systems. Attribute files for generating programming for the MICROCHIP PIC processors and the Parallax BASIC STAMP and Propeller Chips are being investigated. We would appreciate input as to the functions that you would like for these applications. If you have new applications for Graphic Programming contact SWFTEC via E-Mail. We encourage OEMs to develope attribute and symbol file sets for their own products and SWFTEC will work with them to deliver a complete solution to their customers. The price for the SWFTEC Graphic Program Generator software is $75.00 USD without an application attribute file set and $100.00 USD with an application attribute file set. Both versions include the Symbol Packer utility for making your own symbol sets from *.bmp files and come with example symbol sets.